João Pedro Stedile says that, in his political life, he has never seen such a tightly disputed election in Brazil. The Landless Workers’ Movement (MST) leader argues there is a clear battle between two projects, which represent “the final round” of class struggle – and the people will be the judge. The debate over platforms and candidates that have no chance of winning are disregarded in this battle. And people’s movements are faced with the task of conceiving new ways to carry on the conversation with the people, support popular platforms, and try to stop the rise of fascism, now represented by the Jair Bolsonaro candidacy. Stedile does not feel the concerns part of the Left voices, and says that, despite the large voter support for the far-right candidate, the majority of the Brazilian people is not at all fascist. But he acknowledges that, with today’s high political polarization, it is very unlikely to have a left-wing government reconciling classes. 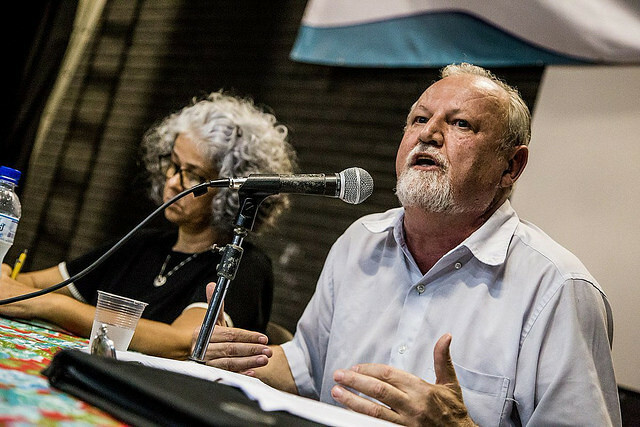 The show Democracia em Rede, produced by the Free Lula Network and Brasil de Fato Radio, spoke with João Pedro Stedile, an economist and member of the national board of the MST. He looked into Brazil’s current political scenario as the elections approach, and also the challenges that will come after the race, pointing out perspectives for the outcome in the first round and runoff. Brazilians will vote for president, governor, Congress, and state legislature next Sunday, Oct. 7. A runoff vote may take place on Oct. 28 if no presidential and gubernatorial candidates win a majority in the first round. Brasil de Fato: How are social movements seeing this election? João Pedro Stedile: We are living a historic moment for the Brazilian society, which has turned the elections into a class warfare, a battle of projects – and, actually, in my short political life, I don’t remember ever seeing another election where two different projects were so clear as right now. Even the 1989 election, which was fiercely disputed, was more of a celebration of democracy, and [Fernando] Collor [who won the elections back then and was impeached in 1992] was regarded as a “hunter of maharajahs” – and he tried to distance himself from Globo [Brazil’s largest media conglomerate] and capitalists. Now, these elections are very meaningful, because they have brought to the election race a class warfare that escalated in the Brazilian society since the economic crisis arose affecting all of us. The economic crisis started in 2008, deepened in 2013, and after 2014 it really worsened. So in order to save itself from the economic crisis – the causes of which actually come from abroad –, the bourgeoisie staged the political coup, to implement a plan that actually means protecting itself and putting all the weight of the crisis on the working class. Brazil is just like the Titanic right now, as the Commander of the Army Eduardo Villas Bôas said. When an economic crisis arises, that is, when the boat begins to sink, people in first class run to pick up the boats, while people in second and third classes, which are working class, are left to drown. And they still have the ship’s orchestra play to distract people in second and third classes. This role of the orchestra here in Brazil is played by Globo, with their soap operas, their fake news, with all the media apparatus they have, they are trying to disperse and deceive the working class. But in this plan where they staged the coup to save themselves, they have not succeeded in getting Brazil out of the economic crisis and, on the contrary, they have generated a social crisis due to the increase in inequality; they have generated an environmental crisis, due to the voracity with which companies come to Brazil now to take over our pre-salt oil fields, our iron ore, our water; and they have generated a political crisis, because the government does not represent anyone. In the history of our Republic, there has never been a government that had an approval rate as low as 3 percent [like the Michel Temer administration has now]. Not only that, this political crisis arises now, this week, after they have failed to have enough unity to endorse a right-wing candidate to be a spokesperson for their platform. That would be Geraldo Alckmin? They tried to achieve this unity with parties around Alckmin, and managed to have 10 parties endorse him. But they forgot to arrange that with the people. Because, to obtain popular unity, you need to have popular charisma, popular representation. And the people have denied this popular representation to the coup-makers. And the only one that emerged on the Right, which was a disaster for them, was [Jair] Bolsonaro. Bolsonaro is the result of the fruit they sowed over the past five years: every day they spoke on Globo against the PT [Workers’ Party], against the Left, against Venezuela, against [ex-president Luiz Inácio] Lula [da Silva], against social equality, against affirmative actions, against black people, against landless people. Well, if you are conveying a daily message that leads to discrimination, misogyny, and fascist ideas, of course these ideas will now emerge around a candidate, and that is Bolsonaro. So they are in a pickle, because, truth be told, Bolsonaro is not a legitimate representative of the bourgeoisie. He is a fascist, he wants to beat and shoot his way through everything. He makes hand gestures with his fingers as if he were holding a gun. I think the bourgeoisie is in a lot of trouble. They were not able to make Alckmin viable and now they do not know what to do with Bolsonaro. Do you think there is a possibility that the bourgeoisie could refuse or even try to prevent [Fernando] Haddad [Workers’ Party presidential candidate] from taking office, if he is elected, and massively support Bolsonaro in a runoff vote? I do not. Of course, these are all assumptions, and you can interview several comrades with different opinions, even on the Left. But what I see is that the bourgeoisie will not risk it with Bolsonaro, because the bourgeoisie, as an economic machine, no longer has that much strength. That became clear with Alckmin. The bourgeoisie with Globo’s apparatus is no longer that strong either. You see, Globo tried to make Alckmin viable as much as it could. The press, which is generally bourgeois, has tried. The latest issue of Veja magazine this week attacks Bolsonaro, showing his “big little” family sins, showing that he also got inexplicably richer. But even so, you see that Bolsonaro’s votes are solid. So, I think in the second round, the votes of the bourgeoisie will split. They no longer have as much power to influence the workers’ vote. In a way, workers are also solid in their interpretation of what is happening in Brazil. So the bourgeoisie is divided? I think the bourgeoisie is divided. It does not have that much power anymore to decide the elections through its economic power. I think that the more intelligent bourgeoisie, which is represented by its organic intellectuals like Delfim Neto, Fernando Henrique Cardoso, Tasso Jereissati, are already nodding. Here in Paraná [state in southern Brazil], even the local toucans [members of the PSDB, Alckmin’s party] have given several signs that they will not support Bolsonaro. So I think this is the smartest move. What I am most worried about is – if, after Haddad wins, they will try to rebuild a class reconciliation government. There is no room for it anymore from an economic point of view. We won the 2002 election because part of the Brazilian bourgeoisie allied with Lula. And with that, a victory was possible, but that victory resulted in the rule of cross-class reconciliation. The Lula administration was good for everyone. All classes felt represented in the Lula administration. From bankers, like [Henrique] Meirelles, to the poor, who have benefited from the Bolsa Família [conditional cash transfer program] and all policies [they implemented]. I think that, in this context of economic crisis, there is no more room for a government of cross-class reconciliation. Because when you do not have an economic crisis, and there is economic surplus in society, it is easy to create public policies that meet the demands from the poor without negatively impacting the profits of the rich. Now the rich are in crisis. The only ones that are not in a crisis are the banks and transnational corporations. What should an eventual PT administration be like? The Haddad administration will have to necessarily impact the banks and large corporations in order to create new jobs again and serve the poor. And the economic agenda is an imperative, so the Haddad administration will have to immediately take action in terms of taxes. Even though from the Legislative perspective it will only be possible next year, the government has ways to control the profit of these companies and even use all the public money to make heavy investments to re-industrialize the country, instead of paying interests. I don’t think that is necessary. Brazil is a rich country. Keep those $200 billion as some kind of backup, economically speaking. But you [can] have a very inexpensive affordable housing program. Think about it, an affordable house costs R$50,000 [around US$13,000 to build], so you don’t need a lot of money to build a million houses. The same goes for the agrarian reform. The same goes for the industrial sector that creates jobs. With a good program funded by the BNDES [Brazil's public development bank] – which was, incidentally, what Lula did in 2008 –, you can resume [these projects]. Even a good management for Petrobras [Brazil’s state-owned oil giant] – just put [José Sergio] Gabrielli back in Petrobras and have Petrobras place orders in Brazil again, and cancel the auctions that they held to sell our pre-salt oil fields, disregarding the law. And then, with emergency measures, we can improve employment, income, and welfare for the working class. But see, it is no longer possible to improve the life of the working class without impacting the profit of banks and big corporations. How can the PT make sure to implement these reforms, especially in today’s political scenario of class struggle, which is very fierce, and also with the rise of fascism that is culminating in agendas that go against the working class? How can it do this? A lot of the criticism of social movements to the PT administrations has been that the party has moved away from the grassroots. Wouldn’t that be the way for the Haddad administration to implement these reforms? The Haddad administration cannot be seen as a PT administration, nor is it on the left. “Oh, so are we going to reconcile again?” No. The Haddad administration is only viable if it is a people’s government. That means that the first agreement has to be made with the people, with the masses and there are many ways to do that: with organized segments, such as trade union centrals, people’s movements, churches – which have a lot of influence with the masses –, the youth. But above all, we have to bring back to Brazil the methods of people’s participation in government, and there can be many ways to do that, with popular plebiscites, for example. So the first plebiscite that the government would have to do is to overturn the measures against the people that the coup-plotting Temer administration implemented, be it the Labor Reform, the PEC 55 [constitutional amendment that limits public spending to inflation for 20 years], or any other absurd measure. Plebiscites are one way, referendums are another, and there are other ways to stimulate the conversation with society, even on the streets. What would be the main tasks of social movements to respond to an ultra-right government, which would be represented by Jair Bolsonaro? Honestly, I think fascist ideas and Bolsonaro do not have the support of the majority of society. Just look at your own environment. If the majority were fascist, they would be on the streets ravaging us. So they don’t have a fascist majority in universities, churches, among merchants, and nobody wants violence as a solution. You can look anywhere, there is no social segment that wants violence. Even among the military police, whose task is to crack down, but within the law, even among lieutenants colonels – I have read over the past days several articles by military police colonels from Sergipe, Ceará, São Paulo [states] arguing that handing out guns to the population or having a more brutal police will not tackle crime and violence. On the contrary, guns kill. That will only create more violence. The case of Rio de Janeiro makes it even more clear, because they increased the repression, they put the Army on the streets, and crime rates went up. So, it did not solve any problems in Rio de Janeiro – on the contrary, it got worse. I do not believe in the viability of a Bolsonaro administration. I think it would be a permanent crisis that would certainly lead, in a few months, to his impeachment. Because, like I said, the right itself is not interested in having permanent chaos and conflict in Brazil. Because chaos and conflict take away the legitimacy and tranquility that capital needs to produce, to make a profit, to export. So imagine a general strike against the Bolsonaro administration. That would affect the capitalists. I’d like to ask you to leave a message for these final moments of the race. An election that began a long time before – it basically began with the coup against President Dilma [Rousseff], and after that coup, society became clearly polarized and practically started the election process there, right? It's true. More than just the elections, the battle between the two projects escalated. And we have to roll up our sleeves this week to really explain that to the people. The demonstration that women staged last Saturday was a beautiful, clear political lesson to the people. The #EleNão (“Not Him”) campaign is not just about Bolsonaro. It’s about the project of the bourgeoisie. And we have to reiterate our project. So when we campaign for Haddad, it’s not just about the election plain and simple. Haddad now represents Lula and the working class project. We have to roll up the sleeves this week to explain to the people that they must decide between two projects: coup-plotting capitalists or workers who are seeking the redemption of a government platform that will place the brunt of the crisis on the bourgeoisie, not on the workers, and will restore a democratic state with policies in favor of the people. And after the first round – since we certainly will not decide on the first round – we have to intensify our work raising awareness. And we tell our activists: we have to campaign in creative ways. This campaign basically had no rallies, and those attending rallies are supporters and activists. So activists and supporters have to be more creative in the way they stand for their ideas and convey them to people in general. And after October 28, our activists will have to go back to do grassroots work, hold local meetings in neighborhoods, people’s meetings at the people’s congress, to discuss what changes the Haddad administration will have to make as soon as he takes office.